Webb Days is a community event that is held every year on the Friday night and Saturday the weekend prior to Labor Day. The activities are Slow Pitch Softball, 5k, Parade, Car Show, Horseshoes, Fireman’s Lunch, Kids Activities including inflatables, Vendor Show, Creative Spirits Painting, Bean Bag Tournament and a Supper & Street Dance at Jackson’s. 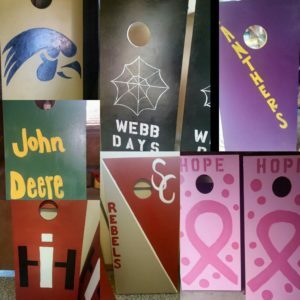 Besides the Webb Day event every year the committee members also have a Fundraiser from which some of the proceeds are donated to a cause in the community. Also please visit us at https://m.facebook.com/webbdays/ for the most up to date information. Webb Days has available 8 sets of boards and bags for rental. Our fee is $10/set for a one day rental. We require a $200 security deposit. Please contact any of the committee members if you would like to rent the boards.